This map shows the proposed business district (in red), along with the current areas covered by the Main Street Enhancement District (in yellow) and Downtown Special Services (in purple). The Rochester Downtown Development Corporation has proposed the creation of a downtown business district that would, for a fee, provide enhanced services to property owners within the district's borders. The district would consist of 13 neighborhoods -- everything within the inner loop and also High Falls, Upper East End, and the Monroe-Alexander neighborhood. 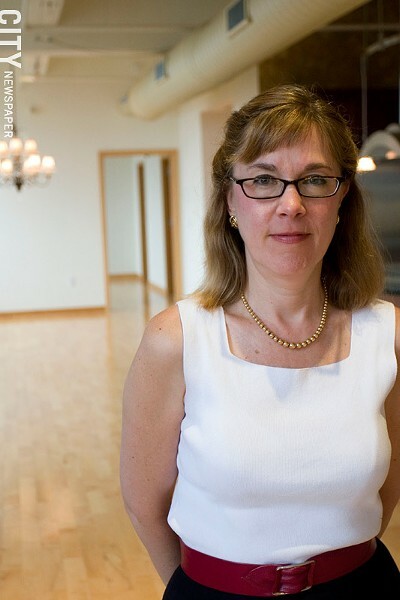 High Falls, Upper East End, and Monroe-Alexander are included because developers and investors are now considering those areas to be part of downtown, says Heidi Zimmer-Myer, president of the RDDC. Zimmer-Myer gave a brief presentation on the proposed district to members of City Council recently. Council members had concerns about the size of the new district, as well as neighborhood identity. 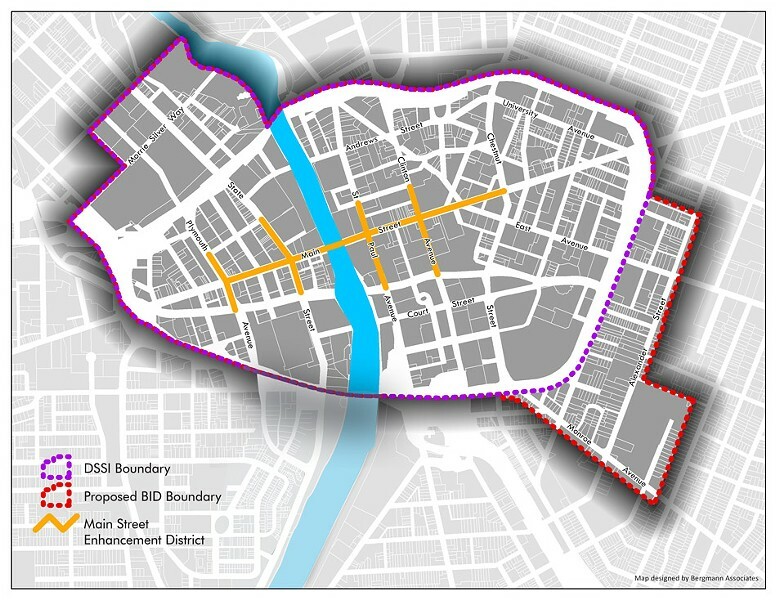 The district would be created by collapsing the Main Street Enhancement District, Downtown Special Services, and the RDDC into a new organization, the Rochester Downtown Partnership. The partnership would be governed by a 15-member board of property owners, tenants, and city appointees. The services provided for property owners would fall into the categories of cleanliness and maintenance; safety and hospitality; beautification; and market support. Some of the services would be litter and weed removal; sidewalk cleaning; limited snow and ice removal; decorative lighting; event production and programming; and support of neighborhood groups and business associations. The service fees haven't been established yet. Zimmer-Myer is supposed to give a more detailed report to Council members in the coming weeks. One of the major concerns about the proposal, according to Council President Loretta Scott, is how to preserve the individuality of the neighborhoods if they're all lumped together into one big district. Zimmer-Myer says that individual identity is crucial and can be honored in many different ways. If there was a banner program, for example, the banners would be customized for each neighborhood, she says. The same sort of thing could be done with holiday decorations, she says. The marketing of the different neighborhoods would be individualized, Zimmer-Myer says, and some of the services would undoubtedly be different. Animal waste removal would be a bigger issue in the East End, for example, than it would at Four Corners, she says. "Each of these neighborhoods has an architectural vernacular that's unique," Zimmer-Myer says. "It has a mix of commercial and residential and institutional [uses] that are unique. And the history and the stories about each one are quite individual. It would be throwing the baby out with the bathwater to run roughshod over that." A majority of property owners within the proposed district would have to sign a petition in favor before the district could be formed, Zimmer-Myer says. She says she's not sure of the exact percentage, but it has to be considerably more than 51 percent. The state comptroller and City Council would also have to approve the formation of the district.